It is recommended that you bring your pet to our veterinary hospital if you suspect a tick bite wound. We will gladly remove a tick should you be nervous to do so at home! Various types of ticks live in different geographies. One white-tailed deer can support more than 450,000 ticks in a year. They have a four part life stage (egg, larva, nymph, adult). Ticks bury their heads under the skin of the dog or cat making them difficult to remove. Ticks can also cause a condition known as Tick Dog Paralysis – the animals appears paralyzed as long as it is in contact with the tick. The most common ticks in Ontario are the “American Dog Tick” and the “Deer” or “Black-legged” tick. Even then, they are not common in the Toronto – we should be more concerned if pets are traveling to the Kingston, 1000 Islands, Point Pelee areas. For this reason, travel history and travel plans are important to note. It takes a tick 48 hours to transmit a disease to the dog. One female tick can lay up to five million eggs in her lifetime. Tick season is April – November although there is a risk throughout the year. Tick borne disease are very difficult to recognize (symptoms can be vague) in both pets and humans – this is why PREVENTION IS KEY! Avoid tick infested areas including overgrown grass and brush in yards. Check for ticks on skin after being in tick infested areas. A daily body inspection and prompt removal (e.g. within 18 to 24 hours) can reduce the risk of infection. 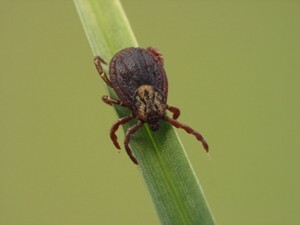 To remove a tick, use tweezers to grasp its head and mouth parts as close to the skin as possible. Pull slowly until the tick is removed. Do not twist or rotate the tick and try not to damage or crush it during removal. After removing the ticks, wash the site of attachment with soap and water or disinfect it with alcohol or household antiseptic. Use a tick control product on dogs to minimize infestation by preventing attachment.